On July 15, “Weird Al” Yankovic released his 14th album of 12 affectionate song parodies, putting his own humorous spin on currently popular songs. However, unlike with his previous albums, Yankovic decided to promote “Mandatory Fun” in a different way: with a significant focus on the internet. 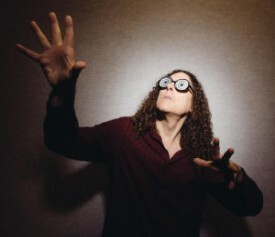 To promote the release of his new album, “Mandatory Fun,” Weird Al Yankovic unveiled eight new music videos within eight days. Entries include “Tacky,” a parody of Pharrell Williams’s “Happy”; “Word Crimes,” a play on Robin Thicke’s “Blurred Lines” that tickles the English major inside us all; “Foil,” a conspiracy theory-fueled takeoff of Lorde’s “Royals”; “Handy,” based on Iggy Azalea’s “Fancy”; and “Sports Song,” a hilariously mean-spirited school fight song. Weird Al was born Alfred Matthew Yankovik, and grew up in the Los Angeles suburb of Lynwood, CA, a locale which greatly inspired his later work. After graduating Lynwood High School as valedictorian, Yankovic attended the California Polytechnic State University in San Luis Obispo (Cal Poly SLO) to study architecture. It was at Cal Poly SLO that Yankovic first performed on a university radio show and recorded his first published piece, a parody of the song “My Sharona” by The Knack, titled “My Bologna.” The parody’s success jumpstarted his highly successful career, which now spans nearly forty years, and includes fourteen studio albums, a celebrated box set, films, and countless music videos. The videos premiered every morning at 9 AM on his website until July 21, where they can still be found. The full album is available in stores, and for download on iTunes and Amazon.